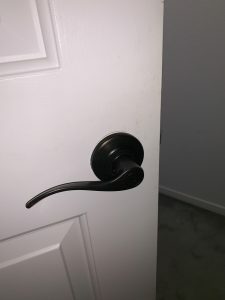 About four months ago, I went to Orchard Supply Hardware for their going-out-of-business sale and bought (among other things) three sets of Kwikset lever-style door handles. (Specifically, Balboa style, in Venetian Bronze finish.) There was nothing wrong with the brass-ish round knobs on the doors in my house, but I found these levers much prettier. But when I got them home, I quailed at the thought of replacing the doorknobs. It felt like a big project, with all sorts of ways it could go wrong. I wanted to wait until Kam was around so she could spot me, and fix things in case of disaster, but I never seemed to get around to this project when Kam was here. So the new levers sat on my loveseat, and later on my coffee table, for months, taunting me. 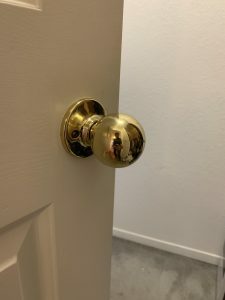 The second and third doorknob replacements took me only about ten minutes each. I’ve long known that Things Are Made Of Stuff, and I’ve even dealt specifically with door hardware before. But somehow it hadn’t occurred to me that replacing doorknobs would be this easy. It was exciting and fun and happy-making and very satisfying to be able to do these few simple steps and end up with my doors looking prettier than they used to, and still working well. I should add that a great deal of the credit goes to Kwikset, which did a great job of designing the levers, creating the instructions, and including all the needed materials in the package. (I imagine that other door-level manufacturers do similarly well; part of the excellence-of-design here was improved by standardization.) More on that to follow in a separate post.